G2R Scarlet Vampire House Escape is another point & click escape game developed by Games2Rule. You are trapped inside the Scarlet Vampire House. 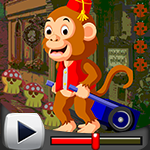 Escape by finding useful objects and hints and solving puzzles. Good luck and have fun!